Tony Healey has provided school photos from when his grandfather Frederick CW Healey (known as Bill Healey) was a scholar there. 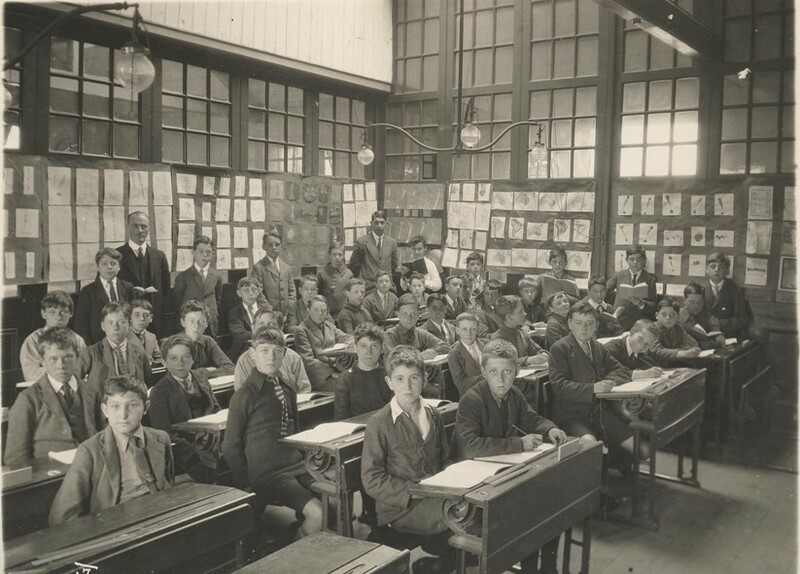 This photo shows his grandfather Bill Healey's class (Class 7) in their classroom. Sandra Ireland, another descendant through Bill's younger brother Arthur Healey, provided a very higher resolution scan in May 2012, allowing names on the art work on the back wall (map drawings) to be confirmed: A Beck, C Collis, C Crisp, P Dear, H Gill (2), H Hill (2), D Padbury, L Sheppard, A Tomlin (these boys may not be in the class in the photo of course). Tony and Sandra believe Bill is 4th row back, 3rd from right. I counted 42 boys in the photo, plus the headmaster, Captain Leonard Revell, in a dark suit standing to the left, and in the corner opposite the photographer is another master. The desks are in pairs with inkwells and a recessed area for pens and pencils, no storage space for books. I'd estimate the boys age as about 12, which dates the photo to c. 1921 or 1922. This photo is marked up in the same way as one of Bill's younger brother Arthur, and it is assumed both photos were taken at the same time. The classroom is very high, with windows on the two walls shown, I think they are internal with either another classroom or corridor on the other side. The classroom has gas lighting. There is no school uniform evident, many boys wear jackets and ties, a few have jumpers with collars instead and trousers are short.